Which initiatives or investments should the Service Providers make in the medium term (2015–2020) to realize the promise of SDN and NFV? What are the hurdles to adoption that can be planned for? How will the Service Providers and supplier ecosystem evolve? How does my progress compare to that of my peers? 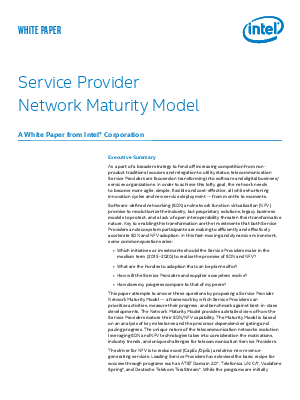 This paper attempts to answer these questions by proposing a Service Provider Network Maturity Model — a framework by which Service Providers can prioritize activities, measure their progress, and benchmark against best-in-class developments.